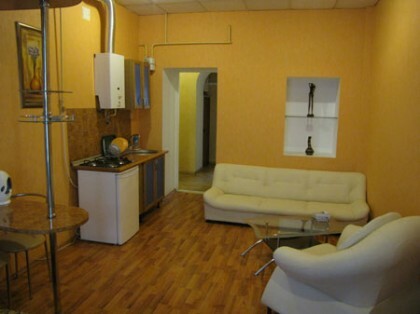 Rental one room flat in Odessa behind the Opera House. 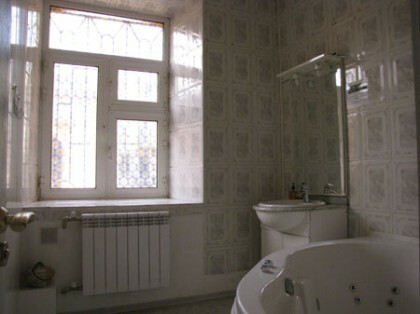 Nice rental flat, near the Opera Theater and Mozart Restaurant! Customer apartment rating: 4.7 of 5 by 3 votes. Cozy, apartment(45 sq.m.) in central historical part of Odessa on Chaikovskiy lane just behind The Opera House within a couple of minutes walk to Potemkin Steps and Sea Port. There is a king-size bed and fold out coach, arm chairs, kitchenette with cooking ware stuff, electric kettle, fridge, table, chairs, air conditioner, cable TV, telephone for local calls, Jacuzzi. Total 3 customer reviews of this apartment. nice place for a single tourist like me. It looked exactly like on the Internet. I did not have to worry about anything, they picked me up at the airport and and arranged me a taxi on the way back. I used the service of OdessaStay on two different trips to Odessa, Ukraine. I was extremely satisfied with the service. I was met at the airport and all the necessary arrangements for my hotel stay were made. 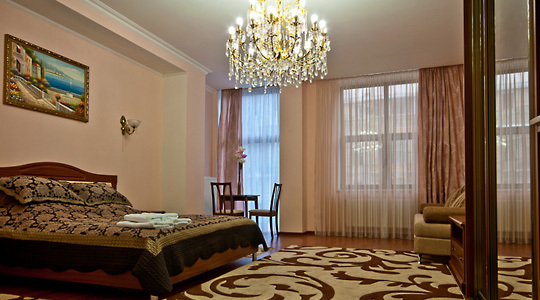 The apartment was near the center of the city and was of high quality. It was much better than staying in a hotel which I had done on a previous trip. I got to experience being a resident of the city by staying in the apartment. Travel arrangements within the city were taken care of when I needed them as well as providing interpreters. The service was very helpful in suggesting things to do while I was in the city. The staff treated me very well and were extremely helpful. I always felt that they went out of their way to make my time their productive and enjoyable. I would definitely recommend them to anyone traveling to Ukraine. They treat their clients with respect and more importantly with honesty. Нам очень понравился Ваш сервис, большое спасибо! Единственный недостаток, это шум газовой колонки и стройка за окном. Но оперный театр скрашивает эти незначительные неудобства! Обязательно посетим Ваш город и "Колу" еще раз!